PARIS (AP) — The black box construction branded “DIOR” was so big it obscured the view of the Eiffel Tower. The sheer scale of menswear designer Kim Jones’ pop-up venue of 2,840 square meters (30,570 square feet) could only mean one thing: he was competing for show of the season on Friday at Paris Fashion Week. 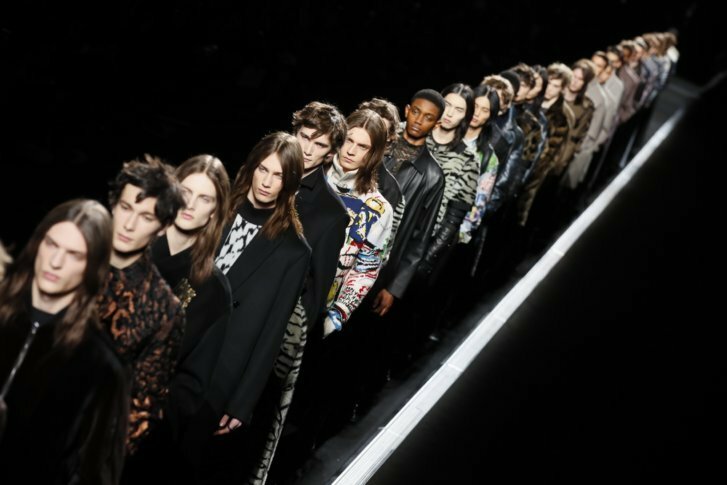 A high-tech conveyor-belt catwalk allowed models to parade before a starry Dior Men front row that included Kate Moss, Lily Allen and a tardy Robert Pattinson. Here are some highlights of the day’s fall-winter shows. At Dior Men, a snaking, meter-wide conveyer belt began moving to thumping music as models in dark, shimmering and couture-infused looks filed by. The late designer’s penchant for superstition became charm bracelets, and his initials a “CD” fastening on a safety pin. Dior’s love of art became a sparkling print of a frowning Mona Lisa on a shirt, jacket and sweater. And Van Assche didn’t let the fall-winter mood dampen any of this zest for color, all the while working in his signature minimalist touches. It’s the kind of frontier-defying cross-pollination that’s healthy in European fashion to keep styles fresh and force designers to constantly challenge their own ideas. It was intentional mismatching and deconstruction at the award-winning South Korean designer Juun J.’s fall display that riffed on the military. Tartan and check insets were pieced together in visually arresting juxtapositions. This formula was employed alongside Juun J.’s signature oversize styles that were puffed up with voluminous layering. Louis Vuitton’s Virgil Abloh had guests second-guessing the meaning of a white bejeweled glove that arrived in the post. It was, of course, a reference to Michael Jackson, to whom he paid a fashion homage. South Korean Juun J.’s “invitation” was a gargantuan black-and-white check woolen scarf — to set the winter scene and demonstrate the designer’s penchant for oversize styles and checks. Berluti won the prize for the clunkiest invite: a hefty wooden block with the label’s details on top.